I know I promised that the next blog post would be about the exquisite Angkorean temple of Banteay Srei, but I forgot about Buddha's Birthday. This holiday is marked in some way throughout the Buddhist world or wherever Buddhists live, but traditions vary. In China and the countries in northeast Asia that were most strongly influenced by Chinese culture, it falls on the 8th day of the 4th lunar month. It's no longer an official public holiday in China proper, but it is in Hong Kong, Macau, and Taiwan, although the Taiwanese government shifted it to the second Sunday in May. It's also an official public holiday today in the Republic of Korea. 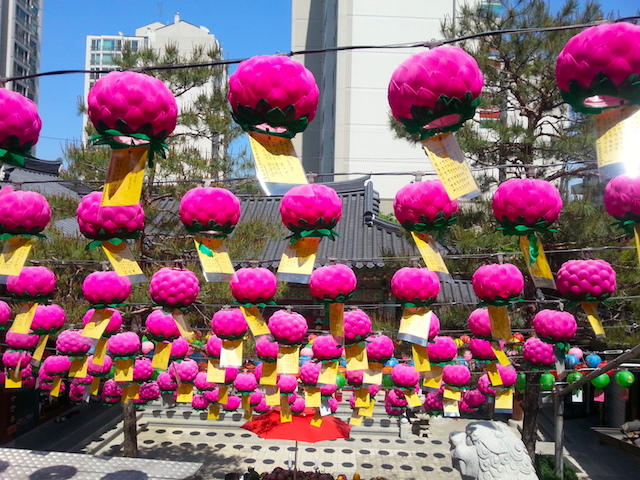 During my years living in Seoul, I observed the celebrations in several different locations. In 2013, I participated in a day-long excursion organized by the RASKB to a number of temples in northern Seoul on Buddha's Birthday. This excursion was led by the estimable F. Jeremy Seligson, who in fact leads such tours annually. In 2013, our first stop was Bomun-sa. Next door is Mita-sa. 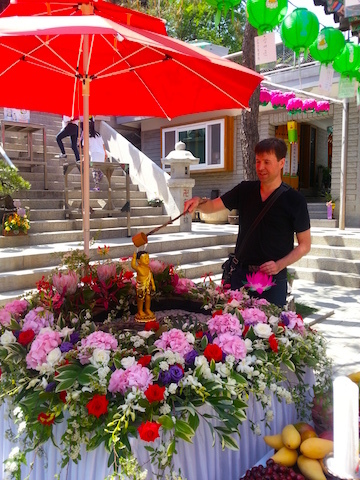 In the picture below, I'm bathing an image of the baby Buddha in the lower court at Mita-sa. In Mahayana Buddhist belief, this holiday celebrates the birth of the Prince Siddhartha Gautama, son and heir of a Himalayan king named Suddhodana, in 563 BCE. This tradition teaches that an astrologer came to visit the court a few days after the baby prince's birth. He prophesied that the infant would one day become either a great ruler or a holy man. The King was determined to prevent the latter, so he saw to it that Prince Siddhartha was enveloped in a cocoon of luxury within the palace. Of course, he did eventually manage to venture outside the palace walls. One day he drove out in his chariot, and what he saw horrified him. What did he see? Sickness, old age, poverty, and death. 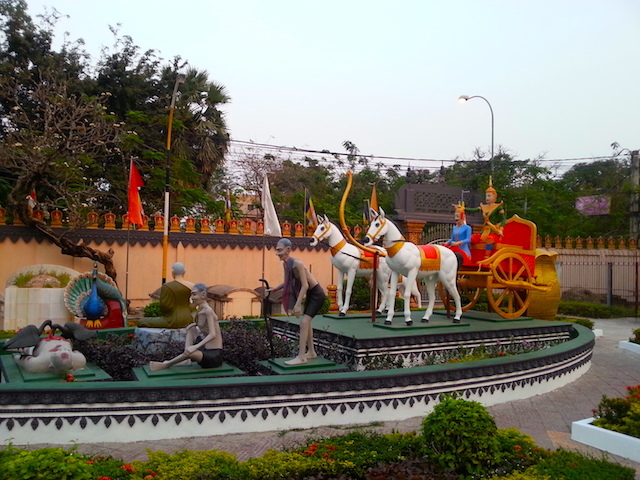 A temple in Siem Reap, Cambodia, has memorably recreated the scene in statuary (see below). In case anyone might miss the point, a tablet provides an explanation in English. 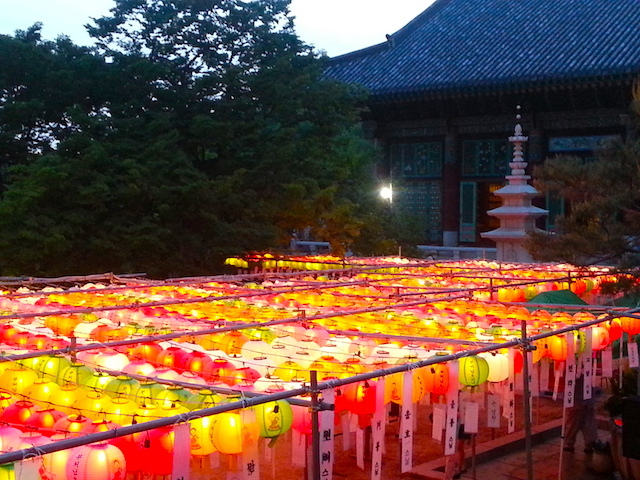 In Korea, the holiday prominently features lantern processions. The largest of them takes places in downtown Seoul around Jogye-sa, the head temple of the country's largest Buddhist sect. 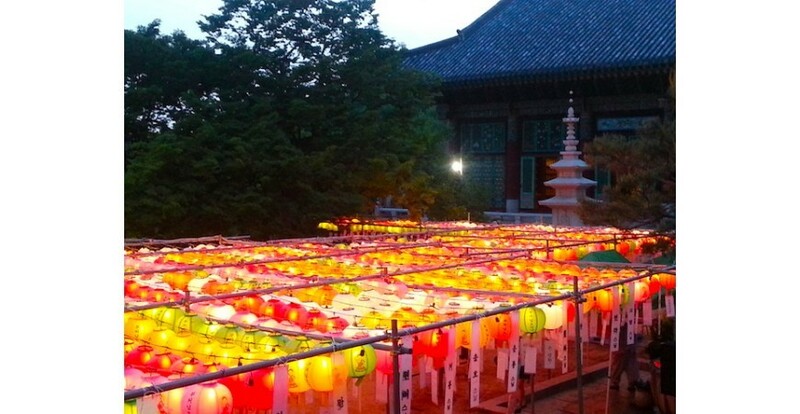 There is also an associated lantern festival that can be observed along the Cheonggyecheon, the belt of reclaimed greenery and water that runs for several kilometres through the centre of the city. Every temple, however, is festooned with lanterns. In 2013, Bomun-sa was decked out comparatively modestly with lotus lanterns. In contrast, another temple that we visited was ablaze with lanterns at dusk. Unfortunately, I can't recall the name of this temple. I only remember that it was on a mountainside roughly behind Yonsei University. In the Theravada Buddhist countries of Southeast Asia, the holiday is known as Vesak. 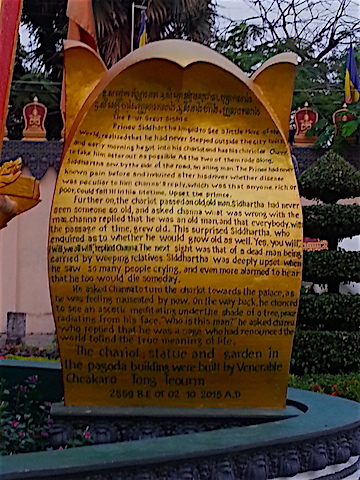 It celebrates not only Prince Siddhartha's birth, but his eventual enlightenment, and his death, all of which are said to have occurred on the same date. It's an official public holiday in Thailand, Cambodia, Laos, Myanmar, and Singapore. In Thailand, it's called Visakha Bucha Day and it's commonly marked with mass merit-making ceremonies. This year it falls on 10 May. Thailand's new monarch, King Vajiralongkorn (Rama X) will preside over the ceremonies for the first time. What are you doing on Buddha's Birthday? Let us know in the comments below, on the Lotus & Persimmon Facebook page (https://www.facebook.com/lotusandpersimmon/) or under a relevant image in our Instagram gallery (@lotusandpersimmon). Memories of a trip to Busan and Fukuoka -- by hydrofoil! Impressions of the capital city of Laos before the flood of Chinese investment.